Back-to-back weekends with NFL action on a Saturday? We'll take it. We came through last Saturday letting you know Atlanta covering on the road in L.A. against the Rams was a lock. What's next for Atlanta? Let's take a closer look at this weekend's Falcons' matchup -- again on the road, this time against the Philadelphia Eagles. With no Carson Wentz at QB for the Philadelphia Eagles, the Atlanta Falcons opened as 3-point favorites. The spread hasn't moved from there. The total opened at 44 before dropping quite a bit following some public action. At the time of publication, 55 percent of the public was laying the points and taking the Falcons. 54 percent of the action on the total has been on the UNDER. • Atlanta is 2-5 against the spread [ATS] in its last seven games in the divisional round. • Philadelphia is 5-1 straight up [SU] in its last six games in the divisional round. • Philadelphia is 5-2 ATS in its last seven games at home. • Atlanta is 6-3 ATS in its last 9 games. • Philadelphia is 1-4 ATS in its last 5 games. • The OVER is 4-0 in Atlanta's last four divisional playoffs games. • The OVER is 4-0 in Philadelphia's last four games after scoring less than 15 points in its previous game. Force 'Em to Throw It: The Falcons' defense was solid last weekend against a potent Rams' offense. The Rams' offense thrives when it's able to mix-and-match with its pass-and-run game, but the Falcons forced them to beat them through the air. Rams QB Jared Goff threw the ball 45 times, becoming predictable and allowing the athletic Falcons linebackers to make an impact on the game. If Nick Foles throws the ball 45 times for Philly, an Atlanta win is guaranteed. Foles is projected to finish with 226 passing yards on 23 completions and 1 TD. Falcons' Offense: Atlanta QB Matt Ryan was efficient last week against the Rams, finishing with 200-plus yards completing 21-of-30 throws. The Falcons also ran the ball for over 100 yards. Above all, though, WR Julio Jones looked like himself after struggling with injuries in the final weeks of the regular season, catching nine passes for 94 yards against the Rams. Ryan is projected to finish with 262 passing yards and 2 TDs. He averages more than three times as many TDs as INTs. Jones is projected to finish with 91 yards on 8 receptions; he averages 0.5 TDs per sim, meaning he finds the end-zone in every other simulated matchup. Sunday night features an intriguing matchup on the NFL slate as the 5-4 Dallas Cowboys host the 8-1 Philadelphia Eagles at AT&T Stadium. Philly will look to avenge their OT loss the last time they were on the road against Dallas. There has been very little movement on the total since it oped at 47, but the spread shifted two-to-three points depending on where you're looking. The Eagles opened as 3-point favorites before settling down at -5.5. At the time of publication, about 66 percent of the public were laying the points on the road and taking Philly. 68 percent of the wagers on the total have been on the OVER. - The total has gone OVER in four of the Cowboys' last six games. - The Cowboys are 9-3 straight up (SU) in their last 12 games at home. - The total has gone OVER in four of the Cowboys' last six games at home. While the Eagles are heavy favorites in Vegas and in the public's eye, AccuScore sim data has the Cowboys actually winning over 50 percent of simulations. How could our data and Vegas differ so much in their projections? The Cowboys have the second-best rushing attack at home and the variables seem to be weighing that statistic heavily. Alfred Morris is projected to finish with 71 yards on 16 carries; Darren McFadden is projected to finish with 30 yards on 7 carries; Dak Prescott is projected to finish with close to 40 yards on 5 attempts. Prescott has the highest probability of all Cowboys to run it into the end zone. With the eye test, Philly looks unbeatable. On paper, though, things aren't as perfect. They only have a +6 turnover margin, with Carson Wentz holding a 23:5 TD:INT ratio. In AccuScore sims, turnovers play the biggest factor -- with Dallas actually winning 67 percent of sims in which they commit fewer turnovers. *New NFL Special: Use code NFLseason and you'll get an all-sports membership for only $159 valid until the end of the NFL season, i.e. through the playoffs and until the day after the Super Bowl on Feb. 4, 2018 (All other sports are included too: NBA, NHL, NCAA Football, EPL, La Liga, etc.)... Join Now! The Dallas Cowboys surprised many experts during last season, as Jerry Jones’ men rode two rookies and a strong offensive line to the best record in the NFC: Thirteen wins. But the playoff run ended quickly in divisional game against the streaking Green Bay Packers. 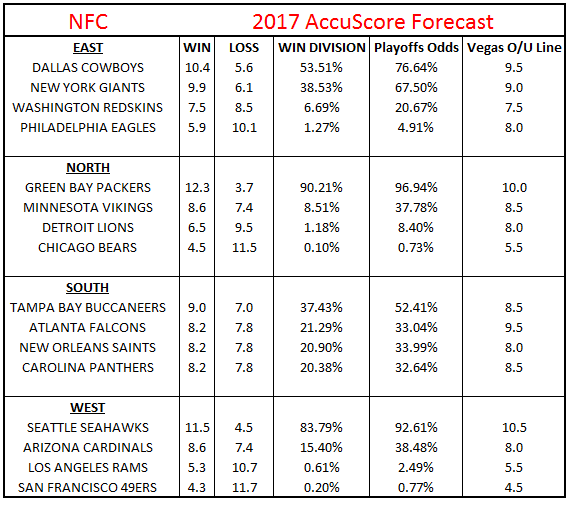 For the 2017 season, Accuscore simulated every game of the upcoming season 10,000 times to project win/loss records, and Dallas projects to repeat as NFC East champions, even with Ezekiel Elliott suspended for six games. This time, simulations show 10 wins for Dallas, but that’s still good enough to finish top of the division pile, though the Packers and Seahawks project to finish with a better record in the conference. Based on these numbers, Cowboys would reach playoffs this time with 76% probability. During the last season Dallas’ defense wasn’t anything close to great. In 13 wins they managed to keep only Cleveland at or below 10 points. More than likely, the offense will need to replicate numbers from a year ago, when the Cowboys scored at least 24 points in all but one win. The biggest changes in Dallas are in secondary. Brandon Carr, Barry Church and Morris Claiborne took off, and Nolan Carroll from Philadelphia signed to replace at least part of the hole left behind. Otherwise, Dallas continues more or less with the offensively dependent team that produced 13 wins. However, there are two big questions hovering around Dallas. Will Dak Prescott keep improving and step up as franchise quarterback after Tony Romo retired? How will Ezekiel Elliott’s suspension affect the team? If these key players can perform, Dallas should hit double digit win and earn the right to play in the postseason yet again. Usual suspects are on the list when we think best bets for your fantasy team. Elliott would be second of the running back list if he got the full six games, but he will likely be a monster after coming back from suspension. QB Dak Prescott is among top 8 quarterbacks based on Accuscore’s fantasy predictions. Also TE Jason Witten is among top 10 tight-ends and WR Dez Bryant is knocking on the door of top 10 wide receivers. With Elliott out, Prescott could be even more pass happy than usual. New York Giants head coach Ben McAdoo did better than expected during his rookie season. They went clearly over Vegas line of 8 wins when the team managed to win 11 games before losing to the same streaking Green Bay in the wild card round of the playoffs. And considering the Giants are projected for 10 wins and a 67.5% chance at the playoffs, the expectations have been raised from a season ago when Vegas had the Giants’ win-total line at 8.0. The Giants’ chances to win NFC East division are around 38%, but the projected difference between the Giants and the Cowboys is only half a game. Eli Manning project to take this division race down to the wire. Offseason moves were quite limited in New York. The high profile free agent signing was receiver Brandon Marshall that moved from local competitor, NY Jets, to the Giants. He would provide additional weapon for 36 year old Eli Manning that hopes to engineer a third trip to the Super Bowl. The Giants will be the fifth team of Marshall’s career. On the defensive line, starter Jonathan Hankins departed to Indianapolis, which adds more of a load on Damon Harrison at DT. For fantasy players Giant’s WR tandem of Beckham and Marshall generate a lot interest. Beckham will be top3 WR based on Accuscore fantasy predictions and clearly number one receiver to produce a high amount of fantasy point week after week. Marshall is a bit on decline in his career, but can still be top 20 receiver in this league. It looks like he would give more value in many leagues compared to Beckham. QB Eli Manning is ranked to 17th when all predicted fantasy points during the season have been summed up. As the running back situation is a bit open, there is no reason to spend draft slots on Giants running back in early rounds. Washington’s chances to win NFC East are around 6% as Dallas and NY Giants are ahead of Redskins in many areas. However, their chances to reach playoffs are a bit over 20%. Last season was a small step backwards for the Washington Redskins. A freak tie led to eight wins, which was effectively 8.5 wins behind the nine win the team claimed in 2015. The Redskins missed out on the playoffs, and Accuscore predicts the Redskins will win between seven and eight games, and that likely would not be good enough for a wildcard berth. Washington needs to get off to a fast start with games against the wounded Eagles in Week 1 and a trip to the rebuilding Rams in Week 2. Washington has the toughest schedule among NFC teams, highlighted by tough non-division road trips to Seattle in Week 9, New Orleans in Week 11 and Kansas City in Week 4. The most notable changes in roster take place in receiver corps. Both starting WRs Pierre Garcon and DeSean Jackson took off from the nation’s capital. As a response, the Redskins signed Terrelle Pryor to be their no. 1 receiver. When reviewing fantasy predictions, Pryor could be one of the top value players among WR. Accuscore’s season fantasy prediction lists him as number seven when all fantasy points are calculated. Tight end Jordan Reed is projected to be an early favorite to collect the most fantasy points among all TEs. His performance has been great, and we don’t have any reason to expect drops. Franchise tagged Kirk Cousins is a top 10 fantasy quarterback in the league but is a couple levels below the likes of Rodgers, Brees and Brady in fantasy. The second pick of the 2016 draft, QB Carson Wentz had a reasonably good rookie season in the helm of Philadelphia Eagles offense. It cannot be compared to Dallas’ Dak Prescott, but he was performing better than no. 1 pick Jared Goff. Unfortunately for Wentz, he's in a tough division. The NFC East has two clearly better teams in the Cowboys and the Giants. Even though the Eagles made some good additions to the offense, simulations predict only 6 wins for Philadelphia. That would be one less than year ago. Based on Accuscore’s predictions, the Eagles will have 5% chances to playoffs. To win the division, they need a minor miracle, as the current probability win the division is around 2%. In games that the Eagles lost a season ago, they gave up at least 24 points to opponents. Comparatively, games the Eagles won only saw them give up 12 points on average. Philadelphia added running back LeGarrette Blount from the Patriots to bolster their running attack. There have been numerous examples of players exceling under Bill Belichick and not quite replicating the same output elsewhere. It will be interesting to see how Blount performs in Philadelphia. There are two high profile additions to wide receivers: Alshon Jeffery and Torrey Smith. This gives more tools to QB Wentz and will improve the offense quite a bit. All three players should gain from each other’s presence. There weren’t any significant additions to the defense through free agency, but the Eagles spent their first three picks in the draft on defense. That should pay off for years to come. Fantasy projections rank QB Wentz to number 24, RB Blount to number 22 and best WR Jeffery to number 30 among all players in their respective positions. These guys can be considered sleepers, but it won’t make too much sense to build the core of your fantasy team with these guys. Based on Accuscore’s fantasy predictions Eagles defense is ranked at fourth from the bottom. Last Chance Membership Special Use coupon code football30 for 20% off All-Access All-Sports membership... Join AccuScore Now!